For fans of all ages, legendary British writer Rudyard Kipling’s complete collection of enchanting fables set in India—the basis of the beloved animated Disney film and a modern cinematic retelling from director Jon Favreau—now available in a deluxe four-color illustrated collectible edition. 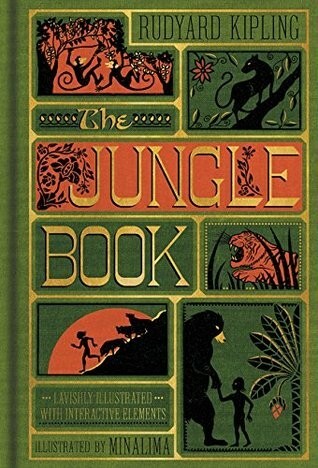 The Jungle Book features stunning artwork and nine 3-D interactive elements crafted by MinaLima Design, the award-winning design studio behind the graphics for the Harry Potter film franchise and the illustrated classic Peter Pan. Since its publication in 1894, Rudyard Kipling’s beloved masterpiece The Jungle Book has been celebrated by generations of readers. Composed of seven tales, each one accompanied by a poem, The Jungle Bookis a coming of age fantasy that introduces a lush, colorful world full of adventure and danger. The first three tales include some of the most charming and unforgettable characters in literature—the man-cub Mowgli, the black panther Bagheera, the wise brown bear Baloo, the ruthless tiger Shere Khan, and the hypnotic python Kaa. 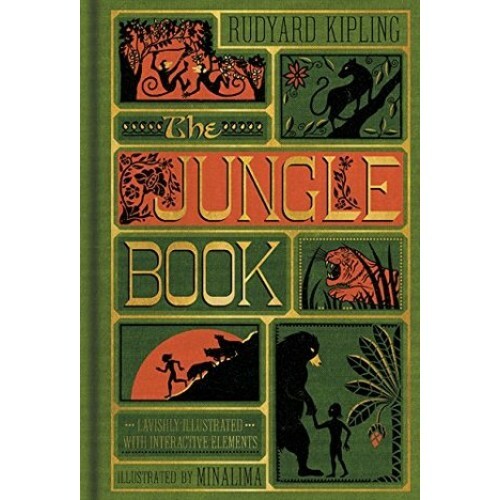 The other four tales each tell the story of a different animal, such as the travels of the white seal Kotick; the battle between the courageous mongoose Rikki-Tikki-Tavi and the deadly cobra Nag; Toomai and the elephant dance; and the camp animals of the queen’s guard.